In collaboration with Displayworks and Avery Marketing, Muse helped design and install a large interactive LED floor for Toshiba America Medical Systems. First unveiled at the 2014 RSNA tradeshow in Chicago, the floor was made with 5mm LED panels set inside a custom raised floor framework which supported the glass panel surface while also providing cable management tracks and ducting for forced air cooling. Interactivity was achieved using a truss suspended solution. As booth visitors walked over the surface, product logos bounced around the floor, inviting them into the Innovation Lounge area of the booth, showcasing the latest and future technologies offered by Toshiba. The modular frame system allowed the use of a smaller section at another show in early 2015. In collaboration with Displayworks and Avery Marketing, Muse helped design and install a large interactive LED floor for Toshiba America Medical Systems. 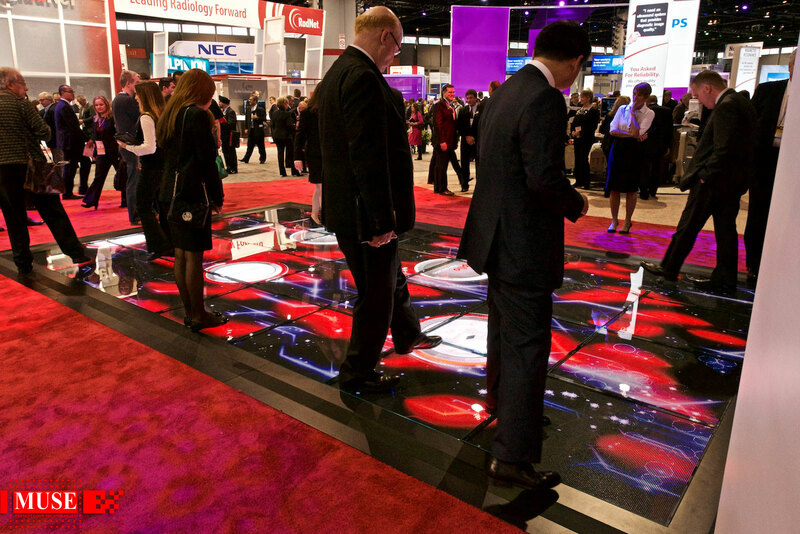 First unveiled at the 2014 RSNA tradeshow in Chicago, the floor was made with 5mm LED panels set inside custom framework which supported the glass panel surface. Interactivity was achieved using a truss suspended solution. As booth visitors walked over the surface, product logos bounced around the floor.